The most common method of accessing system messages that networking devices provide is to use a protocol called syslog. Syslog is a term used to describe a standard. It is also used to describe the protocol developed for that standard. The syslog protocol was developed for UNIX systems in the 1980s, but was first documented as RFC 3164 by IETF in 2001. Syslog uses UDP port 514 to send event notification messages across IP networks to event message collectors. Many networking devices support syslog, including: routers, switches, application servers, firewalls, and other network appliances. The syslog protocol allows networking devices to send their system messages across the network to syslog servers. There are several different syslog server software packages for Windows and UNIX. Many of them are freeware. 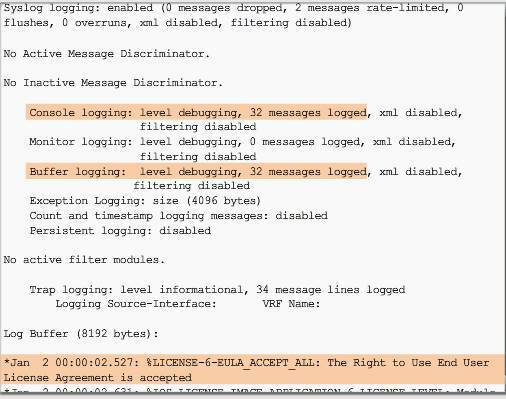 On Cisco network devices, the syslog protocol starts by sending system messages and debug output to a local logging process internal to the device. These messages can be retrieved without the need of accessing the actual device. Log messages and outputs stored on the external server can be pulled into various reports for easier reading. Alternatively, syslog messages may be sent to an internal buffer. Messages sent to the internal buffer are only viewable through the CLI of the device. Finally, the network administrator may specify that only certain types of system messages are sent to various destinations. For example, the device may be configured to forward all system messages to an external syslog server. However, debug-level messages are forwarded to the internal buffer and are only accessible by the administrator from the CLI. Note: You can remember the order above with the sentence: “Eventually All Critical Errors Will Not Involve Damage”. Warning Level – Emergency Level – These messages are error messages about software or hardware malfunctions; these types of messages mean that the functionality of the device is affected. The severity of the issue determines the actual syslog level applied. Debugging Level – This level indicates that the messages are output generated from issuing various debug commands. Notification Level – The notifications level is only for information, device functionality is not affected. Interface up or down transitions, and system restart messages are displayed at the notifications level. In addition to specifying the severity, syslog messages also contain information on the facility. Syslog facilities are service identifiers that identify and categorize system state data for error and event message reporting. The logging facility options that are available are specific to the networking device. For example, Cisco 2960 Series switches running Cisco IOS Release 15.0(2) and Cisco 1941 routers running Cisco IOS Release 15.2(4) support 24 facility options that are categorized into 12 facility types. Log messages can be time-stamped and the source address of syslog messages can be set. This enhances real-time debugging and management. When the service timestamps log uptime global configuration mode command is entered, the amount of time since the switch last booted is displayed on logged events. A more useful version of this command applies the datetime keyword in place of the uptime keyword;service timestamps log datetime , this forces each logged event to display the date and time associated with the event. Recall that NTP is a protocol that is used to allow network devices to synchronize their time settings with an NTP server. To allow the software clock to be synchronized by an NTP time server, use the ntp server ip-address command in global configuration mode. Use ntp master number to set a router as NTP server. To view syslog messages, a syslog server must be installed on a workstation in the network. Eg. kiwi syslog server. The syslog server provides a relatively user-friendly interface for viewing syslog output. The server parses the output and places the messages into pre-defined columns for easy interpretation. If timestamps are configured on the networking device sourcing the syslog messages, then the date and time of each message displays in the syslog server output. By default, Cisco routers and switches send log messages for all severity levels to the console. On some IOS versions, the device also buffers log messages by default. To enable these two settings, use the logging console and logging buffered global configuration commands, respectively. The show logging command displays the default logging service settings on a Cisco router. On most Cisco IOS routers, the default severity level is 7, debugging. The output also notes that 32 such messages have been logged. The second highlighted line states that this router logs to an internal buffer. Because this router has enabled logging to an internal buffer, the show logging command also lists the messages in that buffer. eg: send log 4 Warning!!Warning!!! Cisco routers can log information regarding configuration changes, ACL violations, interface status, CPU utilization, and many other types of events. For example, use the memory free low-watermark threshold io and memory free low-watermark processor commands to set memory thresholds. The router will send notifications, specified in kilobytes to the syslog server when available free memory falls below the threshold. The router will send notifications again when the available free memory rises to five percent above the threshold.